If your children’s repertoire of vegetables includes mostly carrots, corn, and peas, here’s an easy way to expand it at dinner or breakfast. 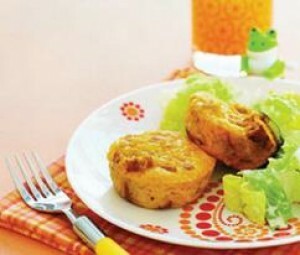 These healthy little quiche cakes are fun to eat (fingers are allowed) and they’re an excellent source of immune-boosting vitamin A and bone-building calcium. SPECIAL OFFER: SchoolFamily.com readers can purchase No Whine With Dinner at 30 percent off the list price, and get free shipping, by ordering the book here and using this promo code: FS2011. Whisk together the eggs, squash, cheddar cheese, Parmesan cheese, and bacon bits in a large bowl until well blended. Using a 1/4-cup measuring cup, pour the egg mixture into each of the bread-filled muffin cups. Bake until golden brown, about 22 minutes. Cool slightly, remove from muffin tins, and serve with maple syrup or ketchup as desired. Variation: For a sweeter alternative, replace the 3 slices of whole wheat bread with 3 slices of whole grain cinnamon raisin swirl bread, and replace the bacon bits with 2 tablespoons of brown sugar.